When asked directly, the billionaire CEO refused to endorse any specific regulations. Facebook CEO Mark Zuckerberg arrives to testify before a Senate Judiciary and Commerce Committees joint hearing regarding the company's use and protection of user data, on Capitol Hill in Washington, D.C. on April 10, 2018. 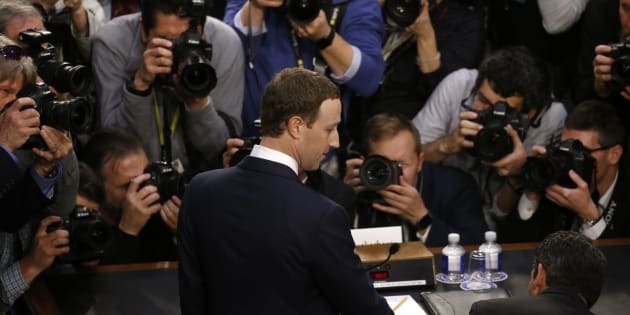 WASHINGTON ― After initially apologizing and accepting responsibility for failing to protect user data, Facebook CEO Mark Zuckerberg declared support for some vague form of regulation as 44 senators questioned him during his first congressional testimony. "My position is not that there should be no regulation," Zuckerberg said. "I think the real question, as the internet becomes more important in people's lives, is what is the right regulation?" Under more direct questioning, the 33-year-old billionaire refused to endorse any specific regulatory proposal. He remained on the defensive, touting his company's idealistic vision. Sen. Ed Markey (D-Mass.) asked Zuckerberg if he would back legislation to mandate that digital platforms like Facebook obtain affirmative consent from users to collect their data for targeted advertising. Zuckerberg dodged: "In general, I think that principle is exactly right." When Sen. Maria Cantwell (D-Wash.) raised the possibility of the U.S. enacting data protection laws similar to the new rules about to go into effect in the European Union, he dodged again. "It's certainly worth discussing," he said. Dozens of cardboard cutouts of Facebook CEO Mark Zuckerberg are seen during an Avaaz.org protest outside the U.S. Capitol in Washington, D.C. on April 10, 2018. These kinds of easy dodges were common throughout the hearing. Zuckerberg received numerous questions that revealed simple misunderstandings about what Facebook does and how it works. He answered questions about how the company makes money ("We sell ads"), how much data it collects, whether it sells data, how targeted advertising works and whether it combines data from its many products. It wasn't clear whether the senators really understood how Facebook worked. Facebook's size and complexity enabled Zuckerberg to elude numerous questions. This was good fodder for humor about out-of-touch senators, but it also underscored how complicated Facebook is. Here, 44 senators had a chance to interrogate the chief executive of one of the most powerful corporations in the world about how it has violated user privacy, fueled the spread of propaganda, crushed competitorswith potentially unfair practices and gutted the news industry by monopolizing digital ad dollars ― and they couldn't quite get their arms around what they were dealing with. The senators, in some cases, were just like most of Facebook's more than 2 billion users: not well informed about what they signed up for. Facebook is a complicated beast. It's not just a social media site where you make meaningful connections with your friends and family, as Zuckerberg tried to sell it to the committee. It's two social media sites: Facebook and Instagram. It's three messaging apps: Messenger, Messenger Kids and WhatsApp. It's a VPN that spies on competitor apps to steal their functions. It's a virtual reality headset manufacturer. It's a platform for other businesses, like games, and also professional researchers. It's planning to release a digital home assistant device. And, of course, it's a digital advertising platform that uses the data collected through all of these products ― and also across the web ― to help advertisers narrowly target their wares to the audience of their choosing. Facebook CEO Mark Zuckerberg testifies before a joint Senate Judiciary and Commerce Committees hearing regarding the company's use and protection of user data, on Capitol Hill in Washington, D.C. on April 10, 2018. Facebook's size and complexity enabled Zuckerberg to elude numerous questions. If a senator slipped up and said that Facebook sold data to advertisers, Zuckerberg pounced to explain that Facebook does not sell data. (It sells space on its website targeted to the users of the advertisers' choosing, based on that data.) At times, it was not even clear that senators and Zuckerberg were using the same definitions for words. The repeated confusion over how Facebook operated was not simply due to senators' ages or lack of tech-savviness. ... It was because Facebook has not been clear about what it does with user data. While Zuckerberg hemmed and hawed about what regulations he supported, he was clear on what he opposed. He does not want Facebook labeled a monopoly. Sen. Lindsey Graham (R-S.C.) asked, "If I buy a Ford and it doesn't work well and I don't like it, I can buy a Chevy. If I'm upset with Facebook, what's the equivalent product that I can sign up for?" Zuckerberg didn't have an immediate answer. It seemed like he wouldn't be able to name Snapchat without snickering. Graham got more direct: "You don't feel you have a monopoly?" "Certainly doesn't feel that way to me," Zuckerberg responded. Sen. Chuck Grassley (R-IA) questions Facebook CEO Mark Zuckerberg as Zuckerberg testifies before a joint Judiciary and Commerce Committee hearing on Capitol Hill in Washington, D.C. on April 10, 2018. Zuckerberg also does not want to risk a Federal Trade Commission investigation. Sen. Richard Blumenthal (D-Conn.) asked him whether he thought Facebook violated its 2011 agreement with the FTC to not mislead users about their privacy when it did not inform people whose information was compromised by the researchers connected with Cambridge Analytica. In the end, what the hearing may have revealed most is the gulf in understanding between Facebook' makers and its users. The repeated confusion over how Facebook operated was not simply due to senators' ages or lack of tech-savviness. At least, not in all cases. It was because Facebook has not been clear about what it does with user data. "I hope what we do with data is not surprising to people," Zuckerberg said at one point.